Please note, not all of the song on the listening station are available (excluding the 72 note and some of the 50 note movements), please check the actual item's tune list for the available songs, we leave songs for you to listen to even if they are not in stock, but the item you are interested in has the current up to date list of available songs! Thank you very much for stopping by Attic's listening station. Here we have created a way for you to listen and preview some of the most popular tunes that you guys usually have requests about. Please allow up to a few minutes for the files to load. If you have broadband there should be no problems at all listening to the tunes. Below are samples of 50. 36, 30, 22 and 18 note movements which are a delight to listen to and all sound amazing. Just click on the link and hear them play. If there are any questions, please don't hesitate to contact us. some may not be at a particular time! In addition, please note that the recordings are not the same quality as it would be when the musical box is right in front of you! You may need to adjust the volume for cetain songs, as not all are recorded to perfection rather to give you a good sense of what to expect. *Please view each items tune list for up to date tune availability or contact us at any time if you don't see the song you want to hear! If you experience any problems, please email us immediately with your difficulties! The recorded music is one single verse of the many that the cylinder plays. *Please allow the music to download, shouldn't take too long. You need the Windows Media Player, this is your default windows media. If you do not have it download it here! Somewhere Out There - From the Movie "An American Tale"
The recorded music is only a sample of the entire tune. 22 Notes Uses Windows Media Player, this is your default windows media. If you do not have it download it here!22 Note Links take longer to download due to larger files, longer and higher quality, so please allow to download. The quality is of course not the same on the recordings but is close, the movements sound a lot better when listening in person. Email Us if you have questions about any recordings or if you are interested in purchasing any tunes, or if you want to install the below movements in a particular box but not sure in which you can, thanks! Please note, these rare 28 note Reuge recorded samples are in stock at this time, in limited amount, they are no longer produced, what we have is what we have, that is it. Category for 30 note music boxes! They will fit in these boxes, for pricing please contact us or call us (818)255-0871 and we will provide a price for a box of your choice with the 28 note movement of your choice. ENJOY!! 30 Notes Uses Windows Media Player, this is your default windows media. If you do not have it download it here! 30 Note Links take longer to download due to larger files, longer and higher quality, so please allow to download. 36 Notes Uses Windows Media Player, this is your default windows media. If you do not have it download it here!36 Note Links take longer to download due to larger files, longer and higher quality, so please allow to download. 1.50 Notes Uses Windows Media Player (MP3 FORMAT), this is your default windows media. If you do not have it download it here! 1.50 Note Links take longer to download due to larger files, longer and higher quality, so please allow to download. Deluxe Rhymes 50 note movements sound much better in real life, they are Exquisite looking and absolutely Phenomenal sounding, you will get a good idea of they sound below. They really do look gorgeous and will make a great addition to a box of your choice. 72 note movements sound a hundred times better in real life, they are Exquisite and absolutely Phenomenal, you will get a good idea below of how they sound. The very essence of gifting something to somebody whom you love indicate that you love the recipient. People when they love somebody, they wish to show it by presenting unique gifts to them. Depending upon their attitude, taste, and their hobbies and other personality traits, they choose gifts. It is the way of showing love and affection. They make sure that the recipient understand the importance of gift and love hidden behind the gift. The thought, the care, the effort, and money spent with love are exhibited in such kind of personalized gifts. Depending upon the item and the type of items and the occasion of the gift, the value of the gift varies. “You are my sunshine music box” is an ideal gift for any music loving recipients. 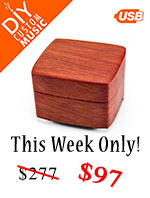 The value of music gift boxes is better understood by the company www.musicboxattic.com. They have got a wide range of gift items. Music boxes are categorized under the tags “Her music box”, “His music box”, “Baby/Child music boxes”, “Music boxes for Mom”, and Music boxes for dad”. 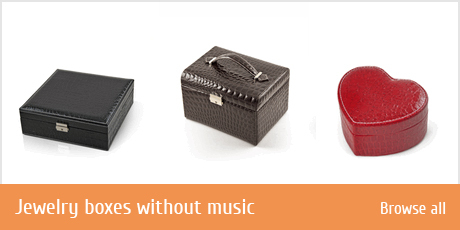 Under each title, again, you have got many varieties of music boxes. The company provides many options that allow you to scan the site depending upon the price, age, and gender so that you can choose a proper and unique gift having an appealing music that the recipient will love your gift like anything. Number of people made it a point to gift the music boxes as they represent harmony and love along with the utility features. The wonderful factor about music box is it can be a collector item. 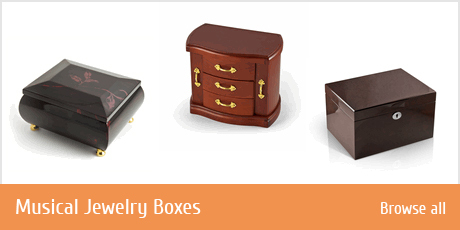 The company offers more than 1,500 styles and varieties of music boxes for gift lovers. The number of tunes is an added attraction; they provide a value added attraction to the gift box. They are aptly called as a music box attic; genuinely it is an attic, which holds a number of tunes that are sweet and melodious. 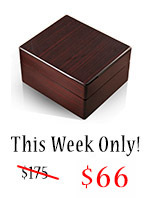 Customize your box and tune. Visit the website and hear all the tunes and select your desired tune or set of tunes so that you can make it personalized. 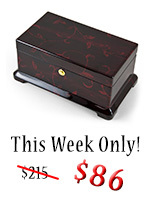 Add wind up music box on your list and enjoy the scores of music.